Timings : 6am to 7pm daily except Monday, no entry fee on Friday. Taj Mahal, the breathtakingly elegant monument is one of the most beautiful masterpieces of architecture found in the world. Listed as the seventh wonder of the world and a World heritage Monument by the Unesco, this perfectly symmetrical dream in marble is located in the city of Agra, in the northern Indian state of Uttar Pradesh, on the banks of the Yamuna River. Taj Mahal is famous as an enduring monument to love. It was built by the fifth Mughal Emperor Shah Jahan as the final resting place for his second wife, Mumtaz Mahal. History says that Arjuman Banu alias Mumtaz, the daughter of Emperor Jahangir's Prime Minister, supposedly captured the heart of Prince Khurram (Shah Jahan) the minute he saw her. In 1612, at the age of 21, she married him and became his beloved consort Mumtaz Mahal. Mumtaz used to accompany Shah Jahan in his military campaigns. She was his comrade, his advisor and she inspired him to acts of charity and benevolence towards the weak and the needy, but even these qualities were diminished by the love that bound her to Shah Jahan. She bore her husband 14 children. In 1630, in Burhanpur, while accompanying her husband on a military campaign she died giving birth to her fourteenth child, at the age of 39. On her deathbed, it is said that Mumtaz asked the king to build a monument so beautiful to show the world how much they loved each other. When her body was brought to Agra, she was laid to rest in a temporary crypt in a garden along the banks of the Yamuna River. The foundation of her mausoleum was laid in 1631. It is also said that his wife's death left Shah Jahan so heartbroken that he locked himself in his private chambers for a month, and when he finally emerged his hair had turned white. Construction of the Taj Mahal began in the same year and was completed after 22 years in 1653 at a cost of 32 Million Rupees. Twenty thousand workmen and master craftsmen- from Persia, France, Iran, Italy and Turkey worked on the building. Although no one knows who planned the Taj, the name of a Persian architect, Ustad Isa, was involved in the construction of this marble monument. Materials such as red sandstone, silver and gold, carnelian and jasper, moonstone and jade, lapiz lazuli and coral were brought in from all over India and central Asia. The white Makrana marble from Jodhpur took a fleet of 1000 elephants to transport. Precious stones for the inlay came from Baghdad, Punjab, Egypt, Russia, China, Afghanistan, Ceylon and Persia. The unique Mughal style architecture combines elements and styles of Persian, Central Asian and Islamic architecture. The Taj Mahal complex (590x300m) mainly consists of the Darwaza or main gateway, the Bageecha or symmetrically planned garden(300x300m), the Masjid or mosque, the Naqqar Khana or rest house, and the Rauza or the Taj Mahal mausoleum. The actual Tomb is situated inside the Taj. The main entrance is from the west, but there are also two other entrances from the east and from the south. The majestic main gateway completed in 1648, is a large three-floored red sandstone structure, 50ft wide and 100ft high with an octagonal central chamber and a vaulted roof, with smaller rooms on each side. The gateway consists of a lofty central arch with doubles storeyed wings on either side. Above the central portal in the north and south side, there is a series of 11 attached chattiris (umbrellas) with marble cupolas, flanked by pinnacles. The walls are inscribed with verses from the Quran in Arabic and is done in black calligraphy. A fine feature of the gateway is that the lettering appears to be the same size from top to bottom. This was done by heightening the letters as the distance from the eye increased. The small domed pavilions on top are Hindu in style and looks regal. The gate was originally lined with silver, now replaced with copper and decorated with 1,000 nails whose heads were contemporary silver coins. The ornamental gardens through which the path lead are planned along classical Mughal 'char bagh' style. Two marble canals studded with fountains, lined with cypress trees emanating from the central, raised pool cross in the centre of the garden dividing it into four equal squares. In each square there are 16 flower beds, making a total of 64 with around 400 plants in each bed. The feature to be noted is that the garden is laid out in such a way as to maintain perfect symmetry. The channels with a perfect reflection of the Taj, used to be stocked with colourful fish and the gardens with beautiful birds. To the west is a small museum that is open daily except Mondays and Fridays between 10am and 5pm. This museum contains original architectural drawings of the Taj, information on the semi precious stones used in its construction, and some celadon plates, said to split into pieces or change colour if the food served on them contains poison. Entry to the museum is free. Taj Mahal itself is situated about 900 ft away at the north end of the garden and stands on two bases, one of sandstone and the other, a raised, square platform (186 x 186 feet) worked into a black and white chessboard design and topped by a huge blue-veined white marble terrace. Tall, white minarets, four of them (41.6m high) grace each corner of the platform. Each has a deliberate slant outwards- the South west by 20 cm, the others by 5cm.On the East and west sides of the tomb are identical red sandstone buildings. On the west is a mosque. It is common in Islam to build one next to a tomb. It sanctifies the area and provides a place of worship. The replica on the other sides is known as the Jawab (answer). This cannot be used for prayer as it faces away from Mecca. The central structure or the mausoleum on the platform is square with beveled corners. Each side is 56.6 m long with a large central arch flanked by two pointed arches. Each corner has small domes while in the centre there is the main double dome topped by a brass finial. The exterior ornamentation is calligraphy, beautifully carved panels in bas relief and superb inlay work in the form of immaculately proportioned large floral tendrils which cover the surface of the white marble. The main chamber inside is octagonal with a high domed ceiling designed to echo chants from the Quran and melodies of musicians. In the middle of this chamber contains false tombs of Mumtaz and Shah Jahan, who actually were laid to rest in precise duplicates in a lower-burial vault. The tombs are surrounded by a marble screen, cut so finely that it seems almost translucent, scatters speckled light around. 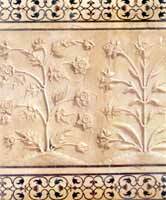 Both tombs are exquisitely inlaid and decorated with precious stones which are the finest in Agra. The 99 names of Allah adorn the top of Mumtaz's tomb, and set into Shah Jahan's tomb is a pen box, the hallmark of a male ruler. Taj Mahal's pure white marble shimmers silver in the moonlight, glows softly pink at dawn, and at close of the day reflects the fiery tints of the setting sun. Perhaps the best viewing of the Taj Mahal is from a little octagonal tower in the Agra Fort across the River Yamuna. It was here that the Emperor Shah Jahan spent his last days as a prisoner of his son and usurper to the empire, Aurangazeb, gazing at the tomb of his favourite wife Mumtaz. Yanni, internationally acclaimed composer and performer was the first ever western artist who performed at the Taj Mahal as part of the 50th anniversary celebrations of India's independence.